Elaine Van Staalduinen has worked in scratchboard, charcoal, pencil and mixed media, but the honesty of black and white excites her. Jan. 13, 2016 11:00 a.m.
Elaine Van Staalduinen’s work can be viewed at the library until the end of February. Elaine Van Staalduinen has worked in scratchboard, charcoal, pencil and mixed media, but it is the beauty of line and the honesty of black and white that excites her, perhaps most when she is rendering images from the natural world. 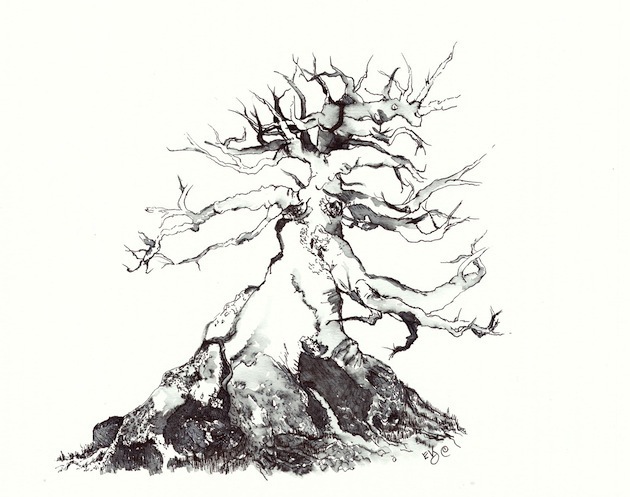 For her new exhibition Burnt, Bent and Broken: The Tree Series in Ink, now showing at the Nelson Public Library, she honed observational skills and technique, delighting in the twists and turns of her subjects and working to discover their mysteries. The exhibition features five beautifully-rendered trees, including The Abandoned Almond, The Front Lawn Apple, The Twisted Chestnut Stump, The Fantasy Tree, and The Bonzai (pictured at left). Van Staalduinen uses technical or crow quill pens in an ink and wash technique that allows for detail, depth and subtlety. A life and art coach influenced by life in Spain and in Canada, Van Staalduinen has shown her work and taught life coaching through art and Spanish in the West Kootenay since she moved to Procter in 2012. More information about the artist is available at elainevanstaalduinen.com. The exhibition continues until the end of February.